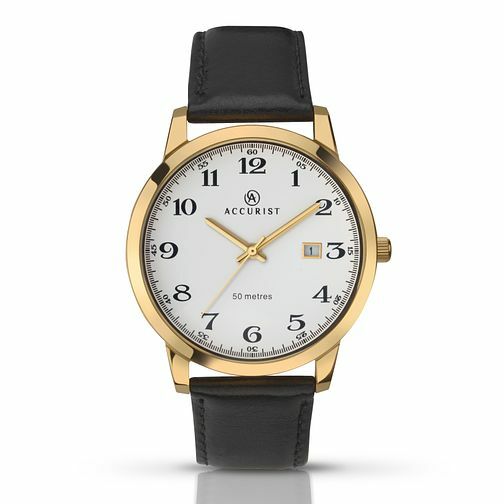 Classic and versatile, Accurist present this stylish men's watch. Featuring a crisp white dial completed with date box housed within a round yellow gold plated stainless steel case, this watch offers effortless elegance with a timeless black leather strap. Water resistant to 50m. Accurist Men's Yellow Gold Plated & Black Leather Watch is rated 5.0 out of 5 by 1. Rated 5 out of 5 by Anonymous from very pleased with my purchase I only reluctantly bought a new watch, and regarded it as a practical task, unconvinced that paying my £60 or so obtained anything better than the digital watch we used to get as free gift from a catalogue, or from the fancy good store for £5. In fact I found the Accurist watch from HSamuel was well designed, stylish and attractive. I don't regret or resent the decision in the least! Delivery was excellent.